An orange flier distributed on the Bates College campus on Saturday, Nov. 5, 2016. Officials at the college have decried it as a clear case of voter suppression. 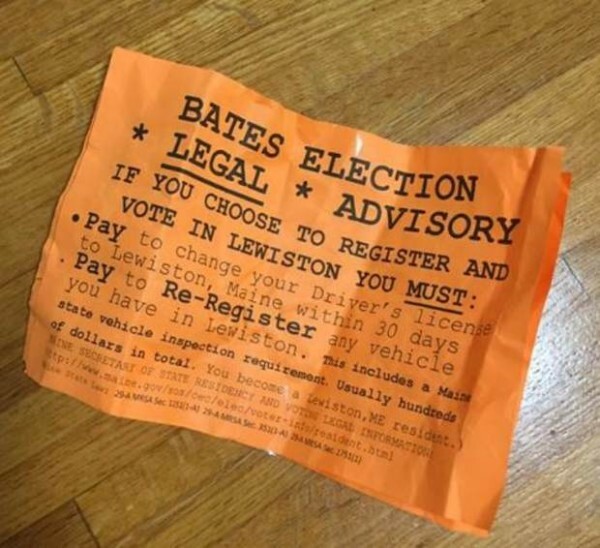 LEWISTON, Maine — Sometime Saturday, orange fliers appeared at a number of Bates College dorms and at the school’s dining hall claiming to be a “Legal Advisory” for Bates students. Bates students and administration, as well as Democratic party leaders in Maine, decried these fliers as clear voter suppression. She said that while she was out knocking on doors Saturday to try to round up votes for a ballot question that would hike the minimum wage in Maine, someone else was at Bates trying to intimidate students into staying home on Election Day. It’s not clear who made or distributed the fliers. The papers gave no indication, despite a legal requirement that they carry a disclaimer. In a tweet, Jason Savage, the executive director of the Maine Republican Party, said his organization had “ nothing to do” with the fliers.